SuperPhillip Central celebrated its five year anniversary this month. 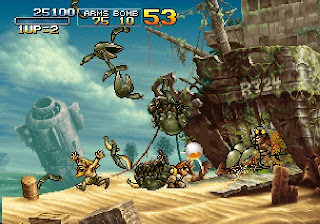 In 2006, the Metal Slug series saw its ten year anniversary. With that anniversary came the release of Metal Slug Anthology for PS2, PSP, and Wii. 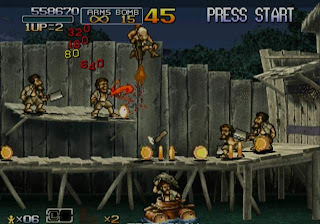 In 1996, the original Metal Slug stormed onto Neo-Geo arcade machines, offering large waves of enemies to blast through as you run and gun through multiple stages. The fun of the series comes from being a fast-paced 2D side-scrolling shoot-em-up with easy controls that were simple enough to learn but gameplay that was tough to master. 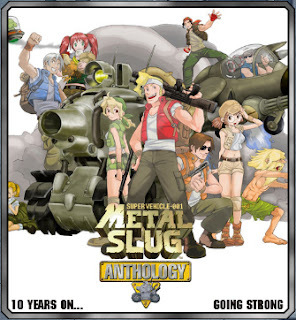 Ten years and after multiple games in the series, Metal Slug Anthology has found its way onto the PlayStation 2, PlayStation Portable and Nintendo Wii (marking the first time since the Super Nintendo that SNK Playmore has published a game on a Nintendo home console). Metal Slug Anthology contains seven titles from the series: Metal Slug, Metal Slug 2, Metal Slug X-- a remake of Metal Slug 2 with new enemy placement and challenges, Metal Slug 3, Metal Slug 4, Metal Slug 5, and Metal Slug 6. The games are a simple run and gun-style affair playable with two characters. You begin with a handgun, but new weapons can be found along the way, though these have a limited amount of ammunition. Such weapons available include the laser gun, the shotgun and my personal favorite, the flamethrower. Torch 'em, baby! Mow through wave after wave of enemies. 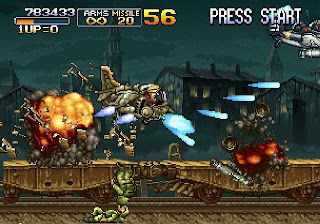 Playing through the Metal Slug games in order is recommended, if only to see how the series evolved over time, adding new features, removing others for a more cohesive and fun gameplay experience. 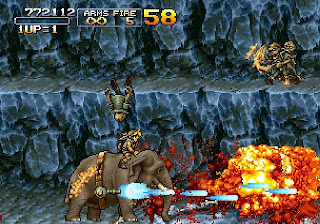 The original Metal Slug introduced the basics and laid the foundation for its many sequels. The game is basic, having players run through linear levels, shooting anything and everything that moves. Hell, you can even shoot the environment on occasion, usually revealing hidden rewards like new weapons and point bonuses. Unlike most run and gun games, such as Contra, running into an enemy does not equal death. In fact, you can actually get up close and melee an enemy to death with a well placed slice of the knife. Levels culminate with a boss, a much larger and more pattern-centric entity. Each level concludes with a big bad boss. 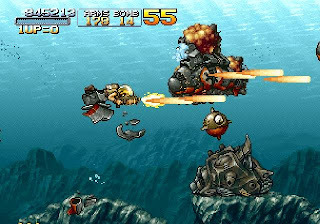 Metal Slug 2 brought with it new weapons in the form of the laser gun, as well as character transformations. One can become a mummy or even obese, slowing down their movements considerably. 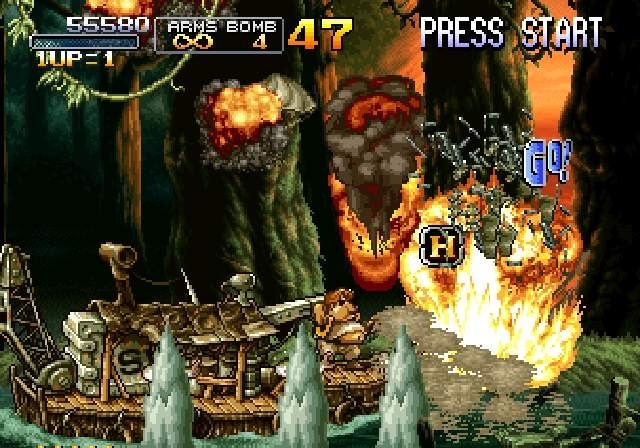 Metal Slug X is a remixed version of the sequel, offering remastered music, changes to the times of day of stages, and new enemy counts and enemy placements. hop in a vehicle and bring on the pain! By far my favorite game of the Metal Slug Anthology collection is Metal Slug 3. Sure, the last level goes on and on to ridiculous lengths, but the branching paths of levels make for a game that has significantly more replay value than any other game on the package. All paths lead to the same end boss for that level, but the difficulty and items gathered differ from path to path. After the drastic addition of branching paths, Metal Slug 4 went back towards a road of safety. The only real upgrades were double heavy machine guns as an available weapon and the ability to transform into a monkey. As with Metal Slug 4, Metal Slug 5 played it safe, offering a side dash and nothing really more to the gameplay. Metal Slug 6 rounds out the collection. The Metal Slug games are really challenging titles, but with the Metal Slug Anthology collection, there is an option to make one's amount of continues unlimited. 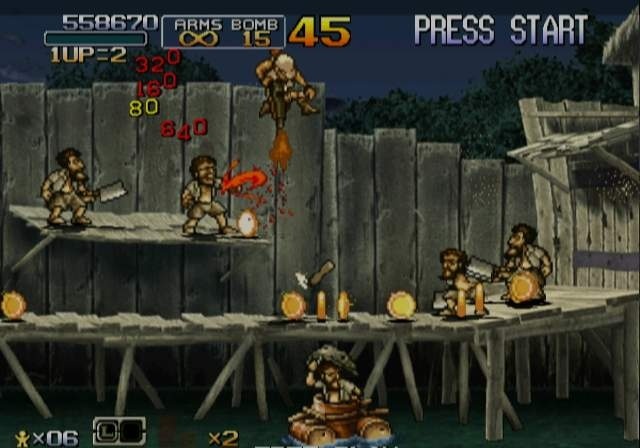 You still have to stay alive until the end of a level if you want to rescue any POWs for a substantial amount of points, but this way even the worst 2D run and gun player can reach the endings of each of the seven Metal Slug games. That's not the end of the options, either. There's also multiple difficulties (which differ the amount of lives you get to work with) and the ability for rapid fire. You're free, Mr. POW! Run and spread joy! Collections are generally supposed to bring more to the table than just a set of unaltered games. 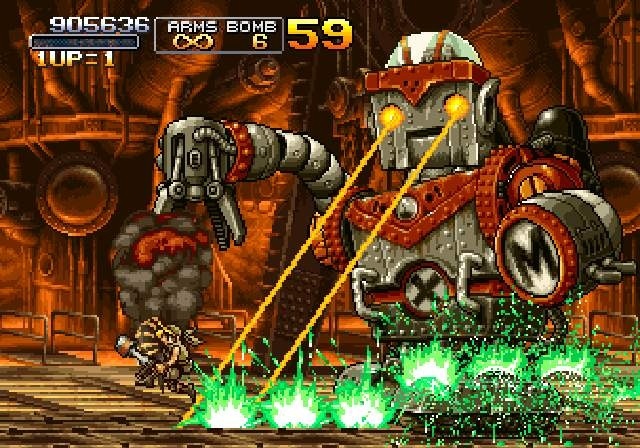 Metal Slug Anthology offers an art gallery, which players can spend medals they earn through playing the games to unlock concept art from each game. They can also unlock songs to listen to in the music player. PSP owners can take the music and save it to a memory stick to be played outside of the collection. They also get exclusive wallpapers as well. Of course, seven games is worth the price of admission alone, but it's nice to see extra content available for those who wish to get the most out of the compendium of run and gun games. There is no weight limit on this ship of destruction! 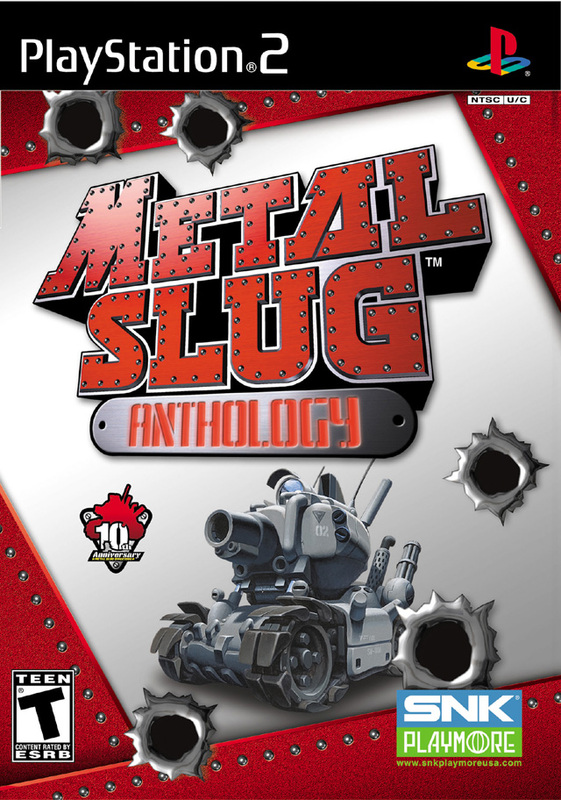 There are three versions of Metal Slug Anthology: one for PlayStation 2, one for PSP, and one for Nintendo Wii. The latter version has some questionable design decisions, such as requiring the player to shake the Wii Remote to toss grenades, having to hold the Wii Remote upright on menus but vertically during the actual games, and there is no Classic Controller support to be found. Meanwhile, the PSP version comes with the aforementioned extras, but it requires two PSPs for multiplayer. The PlayStation 2 version seems to be the best of the bunch, but the PAL version has a delay that is quite noticeable when buttons are pressed. Just wait 30 minutes after eating. 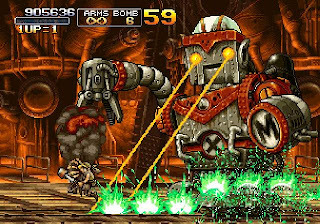 Regardless of which version of the game interests you, you really cannot go wrong with Metal Slug Anthology. The collection is a nice compendium of some of the best run and gun side-scrolling shoot-em-ups on the market. Some Metal Slug games are better than others, but they are all worth playing. The addition of a beginner-friendly option for unlimited lives means all can enjoy the games and not just seasoned veterans. If Metal Slug Anthology was an army, it would be my recommendation to enlist in it.